I feel for you, I really do. However, think of all the money you will save; and how your wife will spend it in a manner more appropriate for the two of you. You may need to weed out the books that are just dust collectors in your home and sell them on e-bay, or you could hold a giveaway contest. All the best in your future reading endeavours. Will you be able to pass up some of the more tantalizingly novels due for release later this year? Titles such as Surface Detail by Iain M. Banks would certainly test my resolve not to spend money. Oh well! Have you any books pre-ordered? Or would such measures be tantamount to cheating on your book-purchasing restraint? I try to weed out every 3 or 4 months and I've got a couple contest coming up so hopefully that will help. But I've limited myself to 10 purchases for the remainder of the year, which doesn't include any pre-orders made before the end of June. I've had Black Lung Captain, The Quantum Theif plus a couple Sub Press books on order for months. Between what I have on order and what I have at home I don't think I'll have time to read much else. 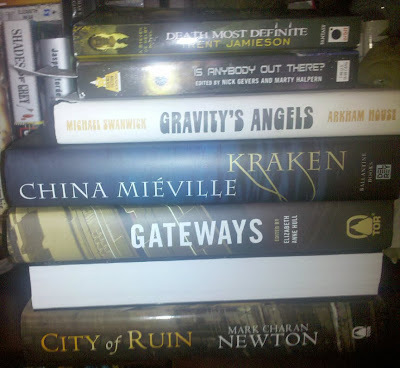 Right now there are 6 books I wish I could read all at the same time: Way of Kings, Kraken, Stories, The Office of Shadows, the next Felix Castor, and The Passage. On top of that I have Antiphon and Deadnought, but I'm trying to wait until closer to publication before diving in. All-in-all this has been a fabulous year for Fantasy and Sci-Fi. I could only hope. Good pledge. My wife only lets me spend money very rarely, so I've come up with some pretty interesting ways of getting free books. Like taking surveys for borders gift cards. Damn, Bryce. You got it in one. I'm so jealous. I need to send in a request if they're already going out. Nice work.